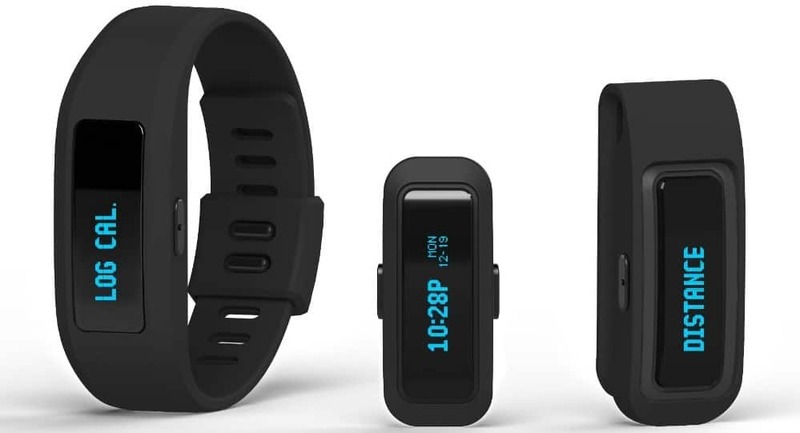 The iFit activity tracker is a lightweight activity tracker that comes with accessories to allow you to wear it both on your wrist (like a watch) or clipped to your trousers. You could pop it loosely into a pocket, but this isn’t advised as it can reduce accuracy. The wrist strap is a bit fiddly, once you’ve loaded the iFit Activity Tracker into the strap you pop it round your wrist and then use two prongs to clip the strap closed and a small plastic square covers the prongs to stop them coming loose (tricky to explain, easier to see the video demonstrating this). Once on it’s comfortable, if a little bulky, but at least it’s very light. It’s the strap itself that’s a bit fiddly and a simple classic watch strap would’ve been a better choice. Given the plastic strap and high price (at the time of review it’s about £20 more expensive than the Misfit Shine or Withings Ox) it’s surprising to find this isn’t waterproof and the plastic strap makes this look rather cheap in comparison to it’s competitors. The charging method is also a little fiddly, making use of a charger that is reminiscent of a little electric chair, you have to hold the tracker in place while pulling a strap over it’s ‘head’ to keep it there during charging. Fortunately this isn’t something you’ll need to do everyday as the tracker has an excellent battery life that easily lasts 7 days. Setting up the unit was very easy and involves downloading an app for your phone, pairing the unit and setting up your account. Note I’ve used this with an Android phone. The app is crisp and clean and allows you to add personal information such as weight, height, birthday, gender. It also allows you to set move time alerts, a really useful feature if you sit at a desk a lot as the unit vibrates to let you know you’ve been inactive for too long. This vibration can also be used as an alarm to wake you up, set a time and the tracker with buzz you awake when it thinks you’re in a light sleep. The app not only logs your step data, but can also log your calorie intake. This can be done either via the fitness tracker by adding a number of calories in increments of 50, or via the app by selecting the type of food you’ve had. The app method allows you to search a food database or alternatively use the inbuilt barcode scanner to pull up nutritional information about your food. You can then select portion size and time of day you’ve had a meal and overall tracking your intake is a nice addition and helps show if you are balancing your calories in and calories out, providing you don’t mind spending the time entering all your meals into your mobile. Day to day you won’t really need to do that much with the tracker, it happily counts steps as you go about your business and has the advantage over a phone based tracker that you’re unlikely to leave it on a desk. Here you find generic Levitra price comparisons and Vardenafil 20mg pills without prescription. The app has a number of menus to see how you’re doing without referring to the app, unfortunately in bright light the screen is difficult to read. As well as reviewing information on the tracker and on your mobile you can also take a look via an online dashboard. It’s a decent little website that gives you access to all your data, unfortunately at the time of review there isn’t a way of sharing data with other apps or services, for example you can’t import weight data or export steps data to your Withings account. The website does offer the ability to create your own workouts via a simple map system, although these are aimed at runners and cyclists rather than walkers. Overall the iFit Activity Tracker is a decent bit of kit that, while a bit fiddly at times, offers a good range of features. When you consider the Misfit Shine is waterproof and the Withings Ox has a built in pulse monitor, it seems iFit are being rather optimistic with the price for something that doesn’t offer anything majorly different from the similar competition.